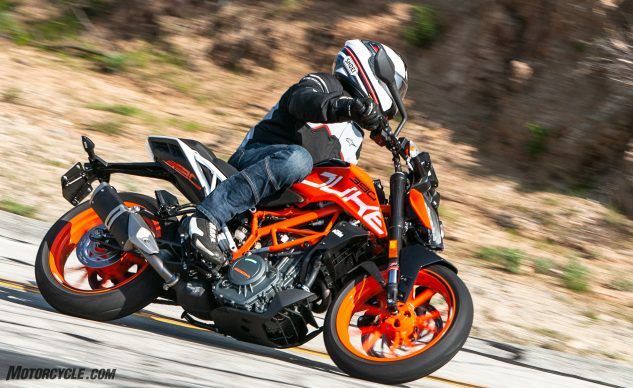 It didn’t take long to find what would appear to be a worthy contender to the KTM 390 Duke. 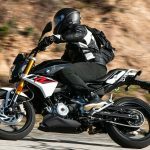 Enter BMW’s new G 310 R. European? Check. Naked? Check. 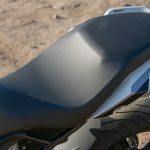 Single cylinder? Check. By golly! I think we should pit these two lil thumpers against each other in a battle to the death! 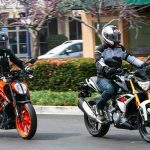 Or at least compare them to help communicate their similarities and differences and perhaps which motorcycle a potential buyer might be more interested in purchasing based on their riding expectations. Nevertheless, let the battle commence! 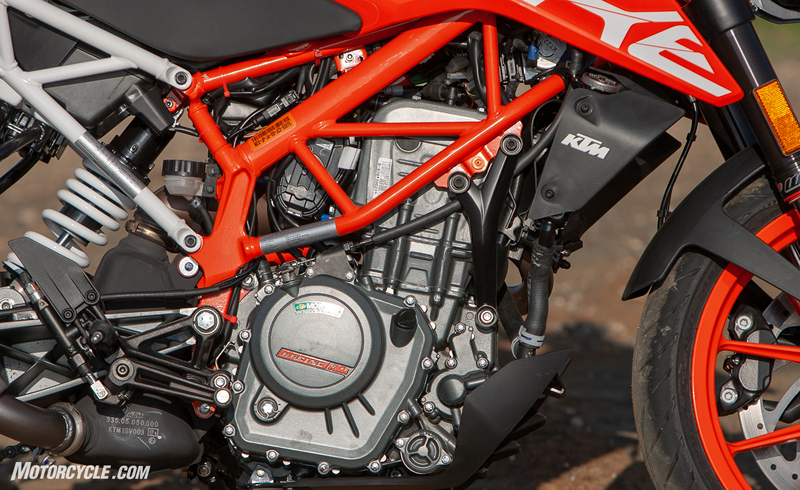 In the orange corner, weighing in at 362-pounds wet, we have the 373cc liquid-cooled, DOHC, four-valve Single and three-time lightweight MOBO-winning champion. 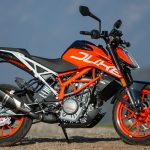 Out of Austria by way of India, the 2018 KTM “Don’t call me entry-level” 390 Duuuuuuuke! 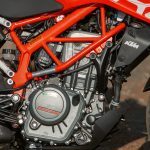 Fighting out of the blue corner, weighing in at a svelte 351-pound curb weight, the new kid on the block coming in hot with a 313cc, also liquid cooled, also DOHC, four valve and also a Single cylinder engine. 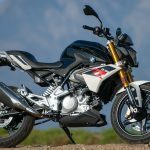 Out of Bavaria, also, by way of India, the “Bavarian Bruiser” BMW G 310 R! 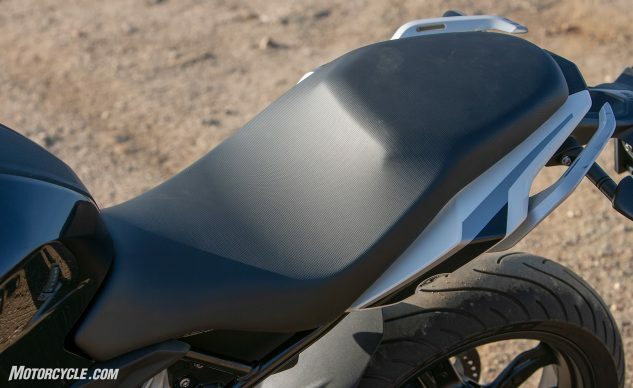 When first swinging a leg over the two motorcycles, we see the BMW will offer a comfortable seating position to a wider range of riders, not only due to the plusher seat foam, but also due to its lower seat height of 30.9-inches when compared to the KTM’s lofty and somewhat firm seat at 32.7-inches. 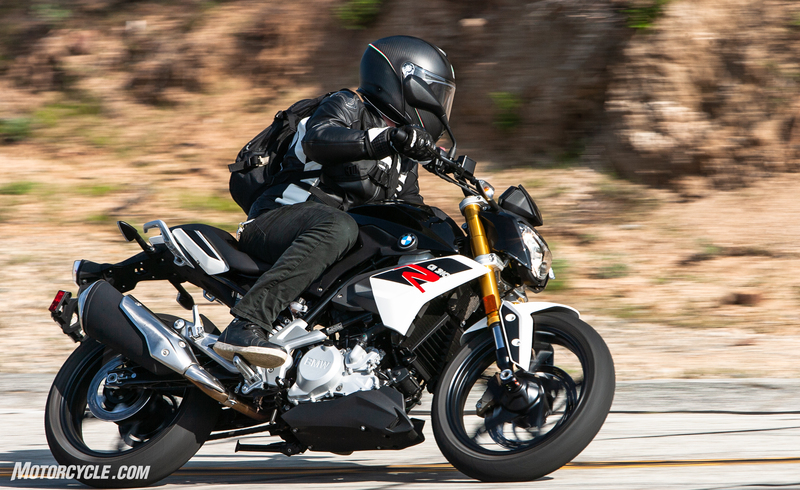 BMW offers a lower (30.3-inch) and higher (31.5-inch) seat height as an option on the 310. 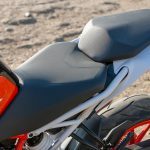 The KTM powerparts catalog also offers a low (31.9-inch) accessory seat as well as a higher (33.5-inch) seat option. 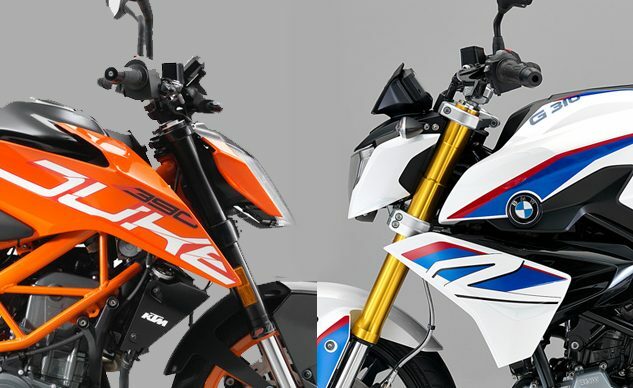 Even with the lower seat on the KTM, it’s still 1.9 inches taller than the standard saddle on the Beemer. 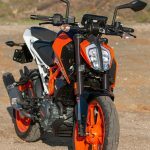 We didn’t see this one coming folks, previously the KTM has stunned with looks alone enough to come out swinging, but the Bavarian is holding its own in round one with a well thought out saddle. 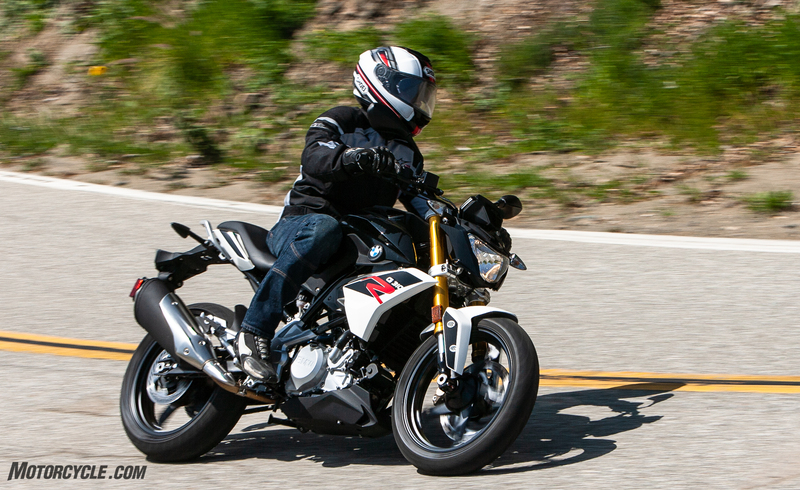 The BMW G 310 R’s one-piece seat provided a decidedly cush ride. 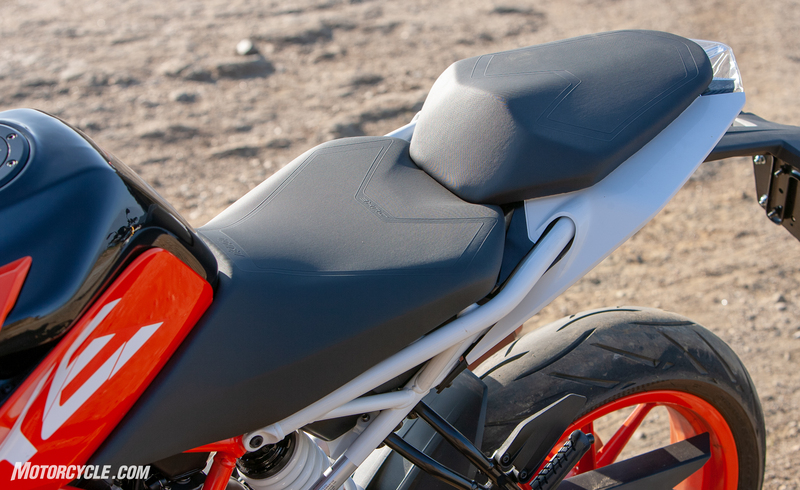 Subtle attention to detail can be found throughout the orange motorcycle, such as the KTM Duke branding on the seat. I have to say, I mostly agree with Troy on this one. 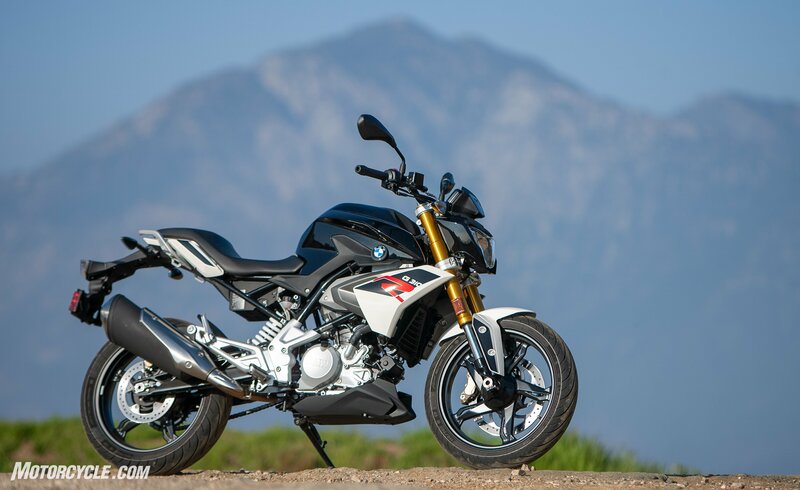 The BMW offers a more relaxed rider triangle overall with a soft seat pleasant enough for all day riding. Though the reach to the bars felt a bit far, it wasn’t enough to bother me, whereas the seat-to-footpeg room had me wishing for lower footpegs on the 310. 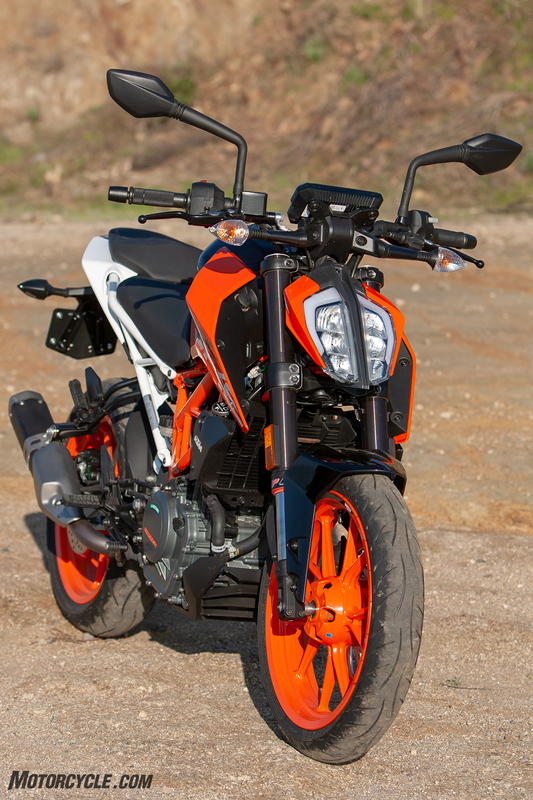 KTM’s aggressive seating position gets me excited from the get-go and lets the rider know he or she is in for some fun with its supermoto style, elbows out, perched over the front tire riding position. 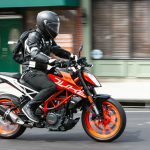 Ample legroom is also welcomed after jumping off of the BMW, and while being firm, the KTM seat didn’t seem overly hard. 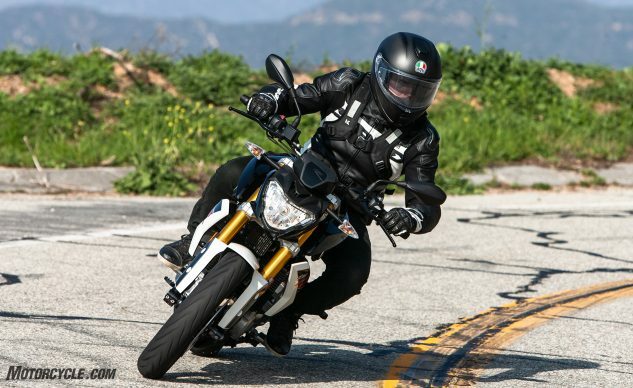 The 390 Duke’s 5.2-inch TFT display is class-leading in the lightweight category. Navigating the menu is a cinch via the back-lit directional pad on the left switchgear. 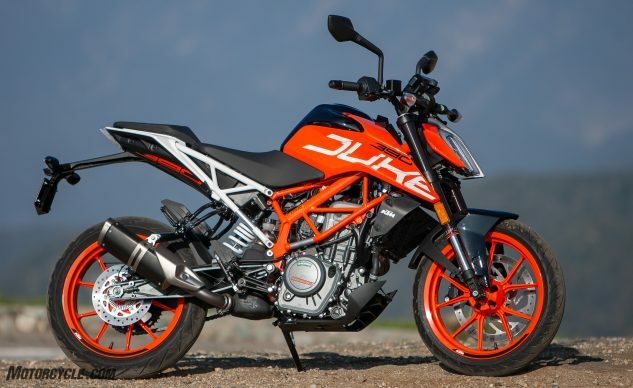 With the first flip of the key, the 390 Duke steps out of the corner looking for vengeance in round two. 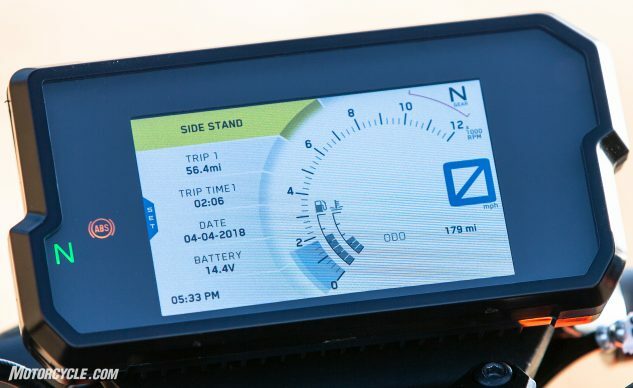 Not one to rest on its laurels, KTM has decimated the competition previously with its 5.2-inch full-color TFT display. A benchmark which has easily remained class-leading. 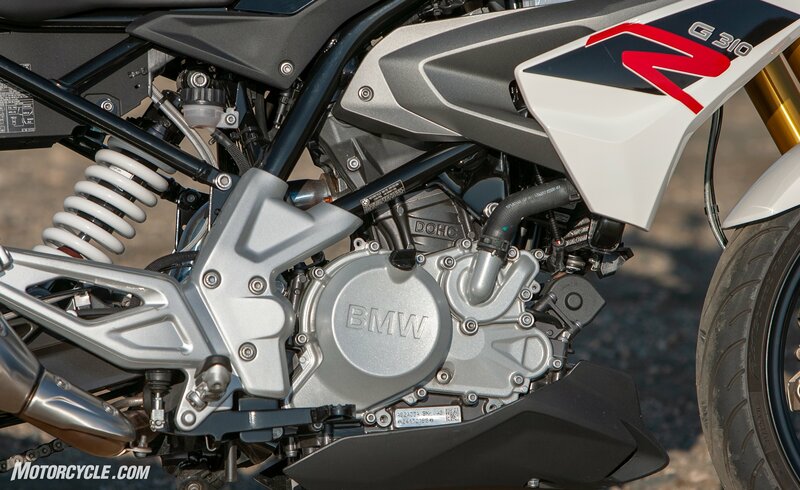 The BMW has nothing for the Austrian early on in round two, bearing a dated, albeit mostly easy to read, LCD display. 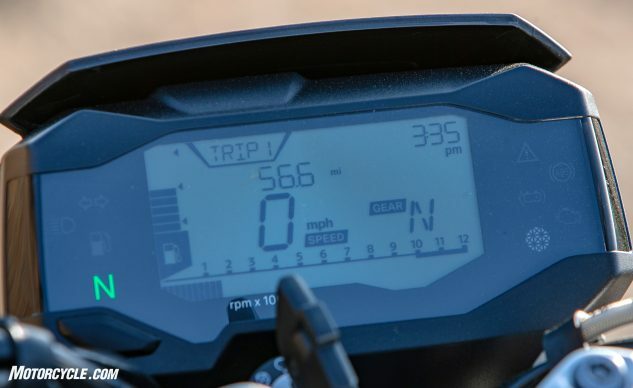 While displaying a fair amount of information on the dash, the G 310 R’s display looks dated when compared to the 390 Duke’s mini-television screen. 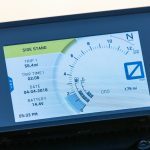 The KTM continues to pummel the BMW with backlit controls on its handlebars, a real premium touch for a motorcycle priced at $5,299. But what’s that?! 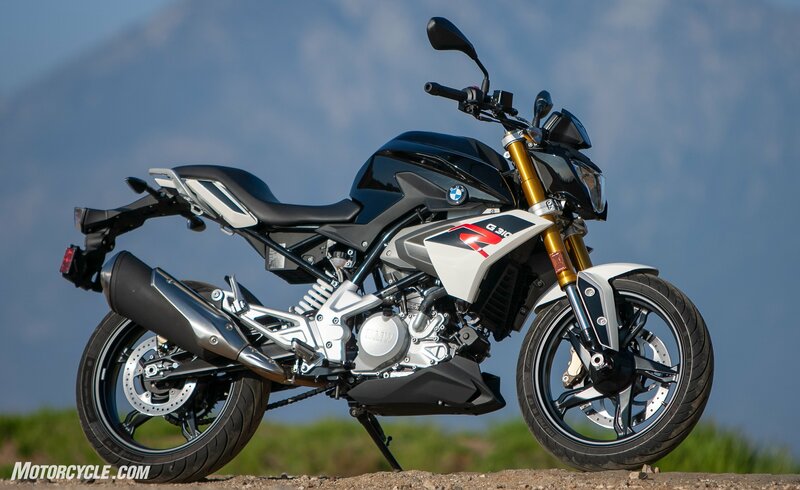 The BMW lands a solid right hook coming in at a price point of $4,750! Nicely done by the folks out of Munich. It’s shaping up to be an exciting round two. 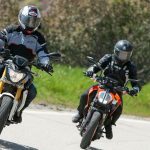 KTM’s answer for BMW’s bottom dollar pricing? 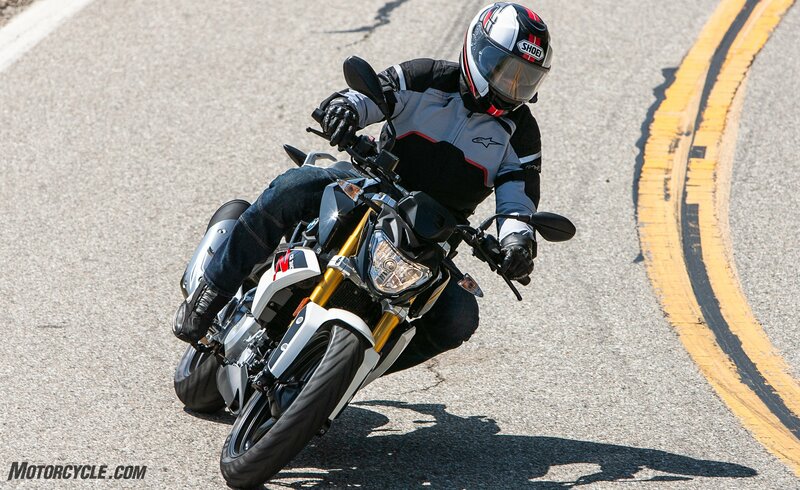 A counter from the Austrian with its adjustable brake and clutch levers, an option the 310 R simply does not have. 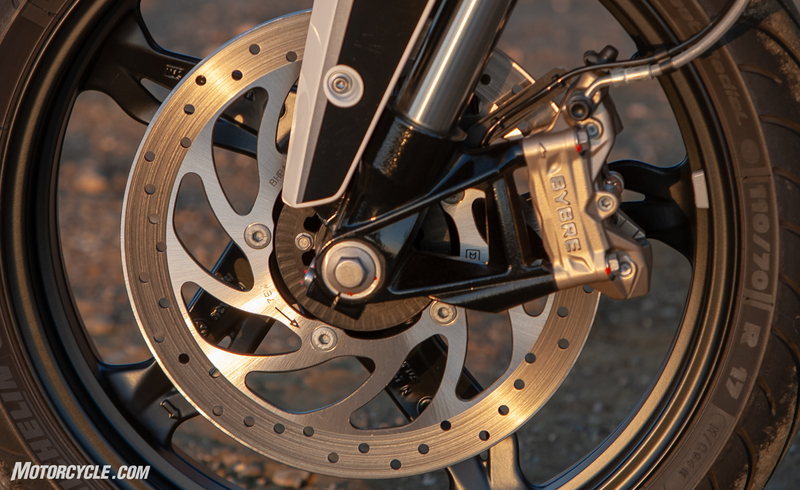 Levers on the BMW offer no adjustment while the KTM’s clutch and brake levers are both adjustable. I’ll tell you what folks, we aren’t even out of the parking lot yet, and we have a couple of brawlers on our hands. These two competitors are pulling no punches this early in the bout. Clutches out, and we are on the road. Oh! And the BMW stalls! 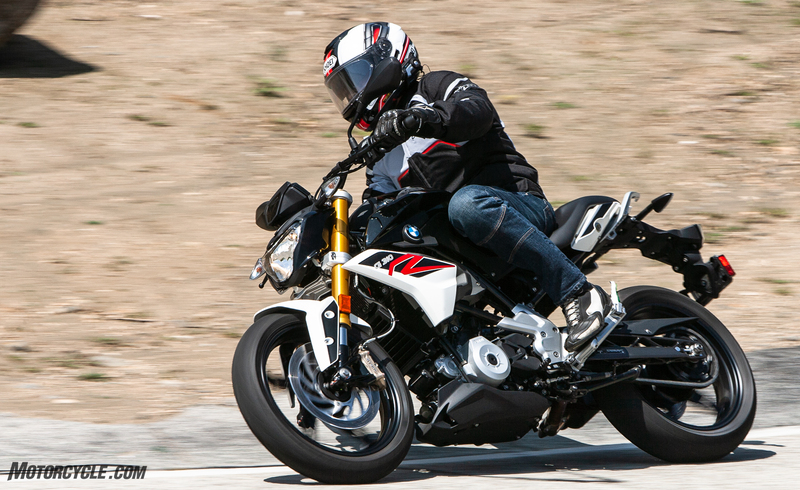 “The BMW needs revs to get going – stalling it is extremely easy!”, says Siahaan. 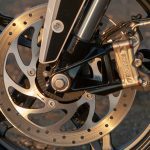 Not a good start to the third round for the Bavarian, although it is quickly noted by Troy that the “Clutch pull felt pretty light, but I’ve felt even lighter clutch pulls from other bikes with hydraulic clutches. 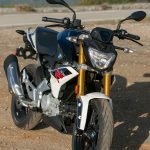 Still, it should be very easy for a newer rider to manage.” The G 310 R needed that breather to come back from its early slip-up. While on the press launch of the BMW G 310 GS, many trained journos stalled the wee-ADV, so when our own Siahaan stalled the 310 R and began to question what he was doing with his life, I assured him it was a normal occurrence. 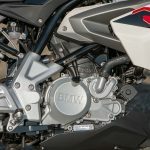 “BMW’s transmission seemed smoother than the KTM. Less clunky, more positive shift feel,” says Siahaan. 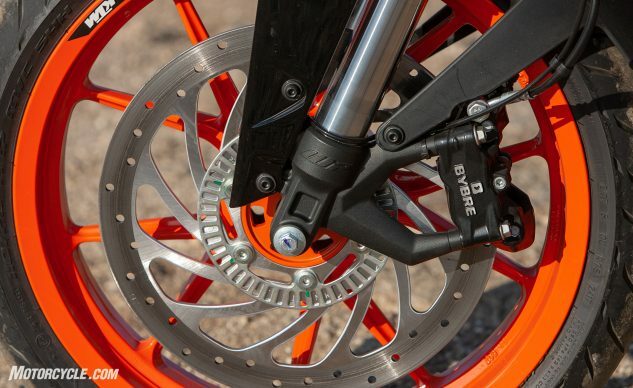 I agree the transmissions felt pretty evenly matched although I would give the nod to the KTM. With no missed shifts, I have nothing to complain about. 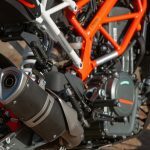 Although Troy preferred the BMW’s gearbox, I found the KTM transmission to deliver positive shifts without error during my time with the Austrian machine. Now on the road, we can take a look at what these two Singles have for each other. 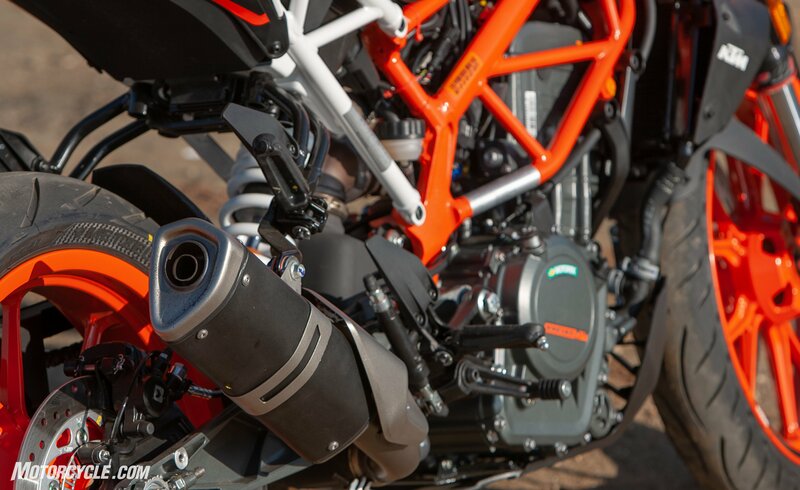 We saw at the beginning of the story; power output goes to the larger KTM mill in terms of performance numbers – and with the lightweight class showing low figures, each horsepower or lb-ft of torque equates to a large percentage of total power. 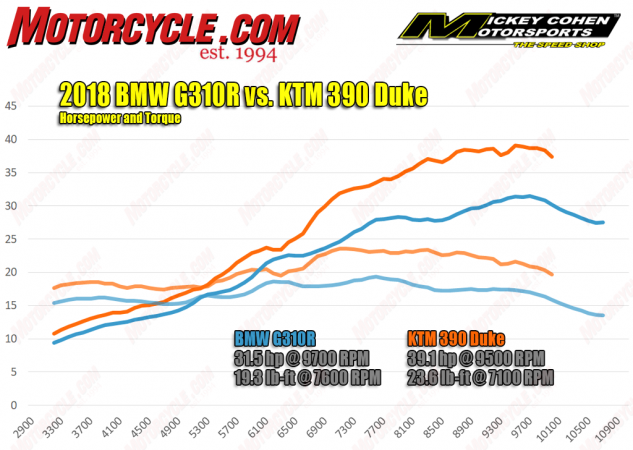 Those are both some lumpy power curves, yet the KTM 390 Duke stays above the BMW G 310 R the entire way up the chart. Around town the two competitors are toe-to-toe, both equally able to bob and weave their way through city traffic. Now it’s time to see how the two singles differ in power production. 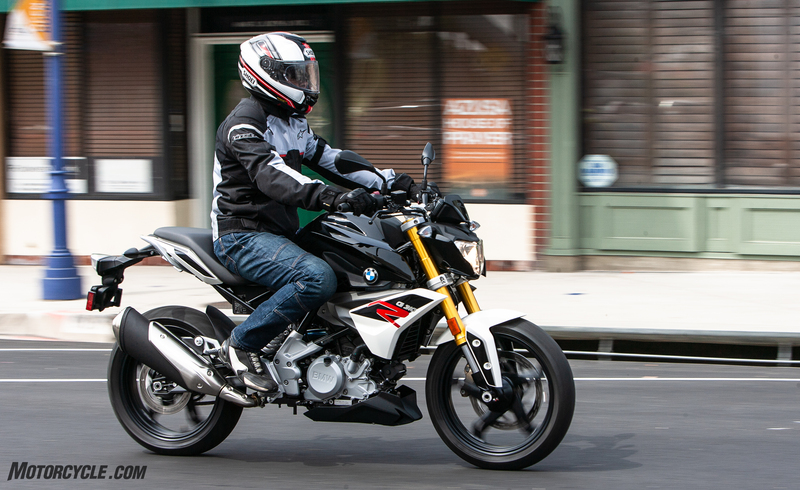 The G 310 R will hustle, it just needs to be spun up a bit to do so. 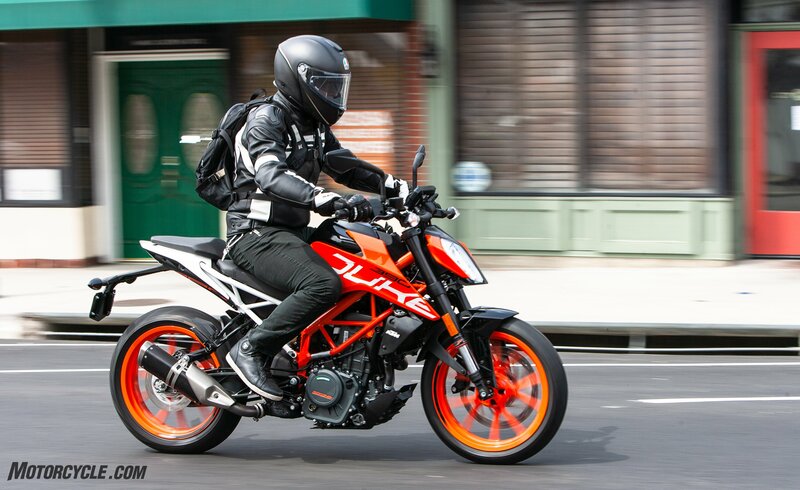 If I had to choose one machine to go into the battle of L.A. traffic, the 390 Duke would be my weapon of choice. 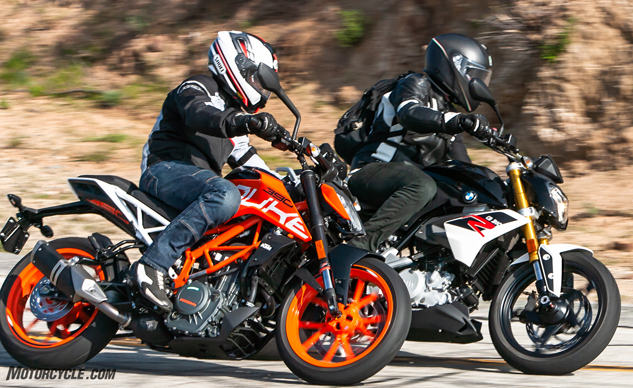 I found the KTM’s riding position more conducive when filtering through grid-locked traffic. 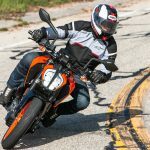 Round three has undoubtedly gone to the 390 Duke with the G 310 R’s early stall and lower power delivery underperforming the KTM’s burlier beating heart. Things are now getting serious as the roads become serpentine. We’ll see how much these two have left in their tanks. 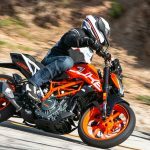 The KTM came into the fight with a 3.5-gallon tank, giving it a .6-gallon advantage over the BMW’s 2.9-gallons. 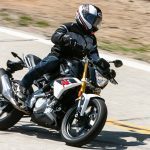 It’s all going to come down to gas mileage now. 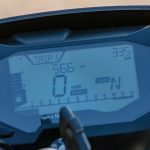 Coach Burns rated the 310’s mpg at 61 and after a few days of riding the 390, I averaged about 52 mpg, which means the KTM should eek out an extra 5 miles per tank. Not much, but every mile counts when you’re that low. 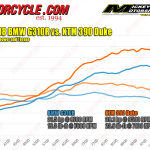 Although Troy didn’t find it bothersome, jumping from the KTM to the BMW highlights the decreased seat-to-footpeg measurement on the 310 R causing more of a bend at the knee. While both fighters were noted for being buzzy up top in the rpm-range, that isn’t entirely out of character for a single. 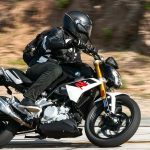 Both bikes spin about 8,000 rpm in sixth gear at 80 mph, yet the BMW seems more stressed while doing so, prompting Troy to make this observation: “When redline is 10k, the engine will be revving its nuts off for any kind of highway riding.” We hope the BMW manages to keep its nuts on – at least till the end of this comparo. Riding home in the dark after our shoot offered a chance to test the headlights side-by-side. There’s really no comparison, the Duke’s LED headlight is quite literally, a beacon in the night. “The BMW’s suspension felt appropriately damped for its purpose. 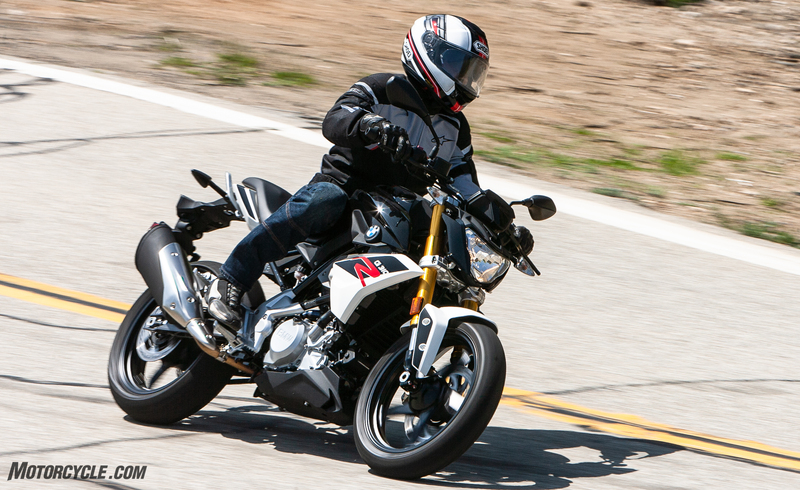 The ride erred towards the softer, more compliant side, but still had enough damping for a spirited canyon run. 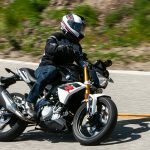 I’d imagine as the bike has more miles on it and the suspension fluid wears down, this will change dramatically,” warns Troy. 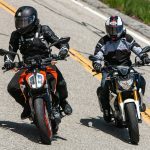 The WP suspension of the KTM, as stated previously, has been the best performing mix of being soft enough for city use and firm enough for canyon duty, that I have ever used at a bike of this price point. 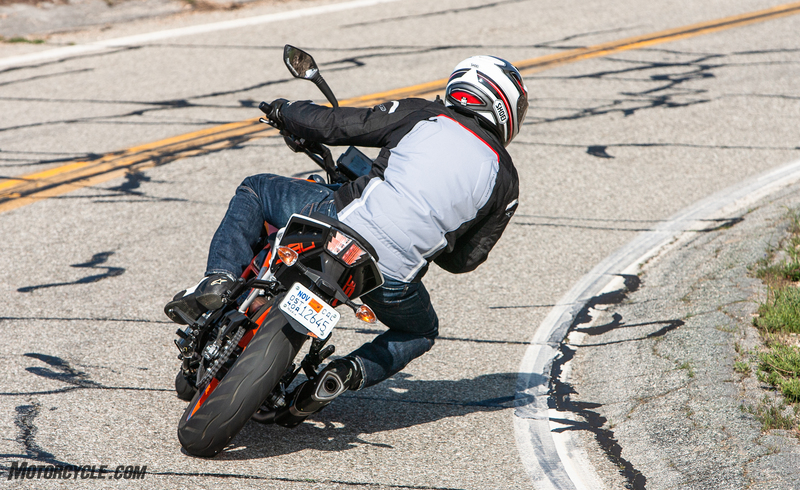 The suspenders on the 390 Duke are fantastic for those who opt for a sportier set up. “From a style perspective, it’s a no-brainer – the 390 Duke looks incredible from all angles. 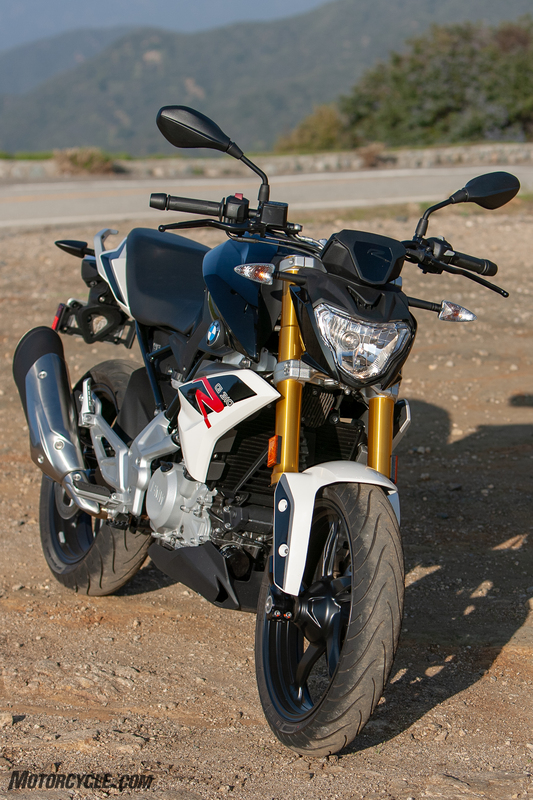 If this were my first bike, I’d be proud to show it off every chance I got. 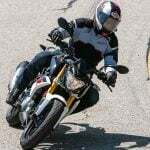 Hell, even if it were my 10th bike I’d be glad to show it off. ” – Troy “Troyboy” Siahaan. There’s no denying that the KTM 390 Duke is an immensely fun canyon carver. 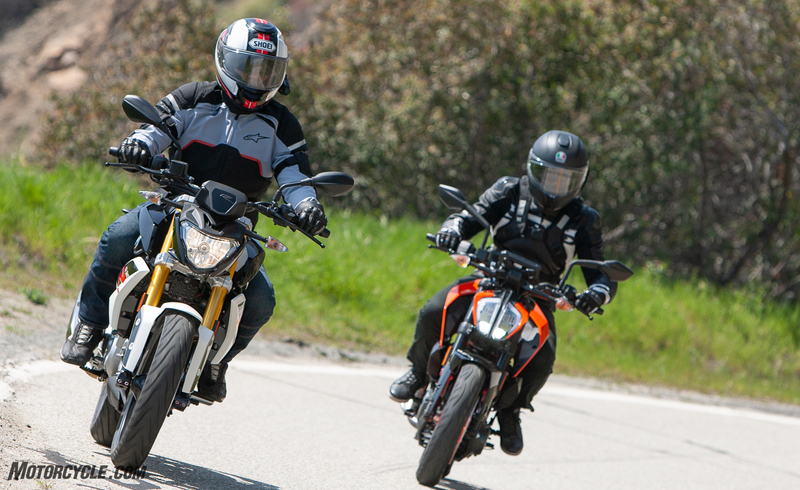 The supermoto-style riding position makes perfect sense when blasting through your favorite twisty roads. 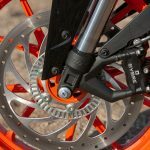 Aside from the adjustable levers on the KTM, Troy found the braking power to be pretty even between the two motorcycles. 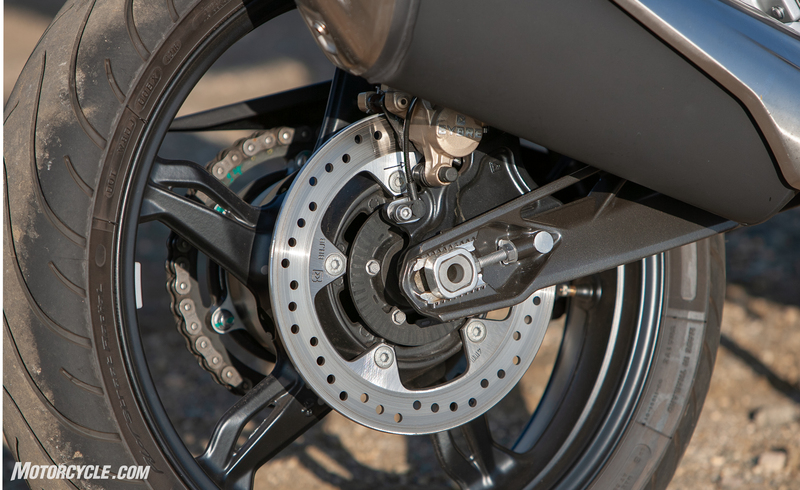 Considering they use the same radially mounted caliper, that comes as no surprise. Whether it be the ergonomics, the stiffer fork, or the 20mm increase in rotor size, I preferred the KTM’s front brake to the Beemer. 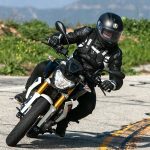 One thing that isn’t up for debate, is the fact that the Duke shows its rowdy side with three modes of adjustable ABS: Road, Supermoto (disables ABS to the rear wheel), and Off. As round four comes to a close and the fighters make their way back to their corners, a winner becomes even more difficult to judge. Spending more time on the curvy roads of southern California, one contender would begin to stretch a gap in both judges’ eyes. 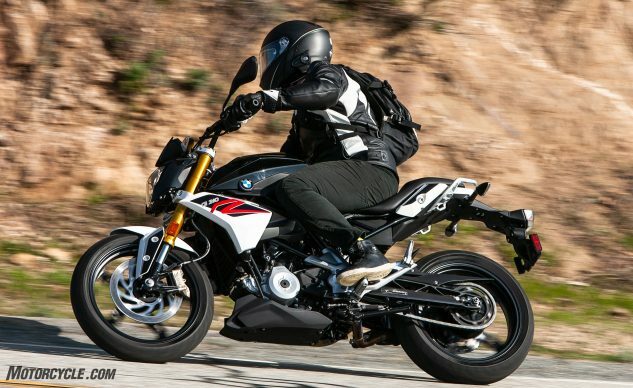 “If I my ride was 90% commuting and 10% canyon riding, I would probably lean toward the BMW.”, remarked Troy while considering the two motorcycle’s strengths. 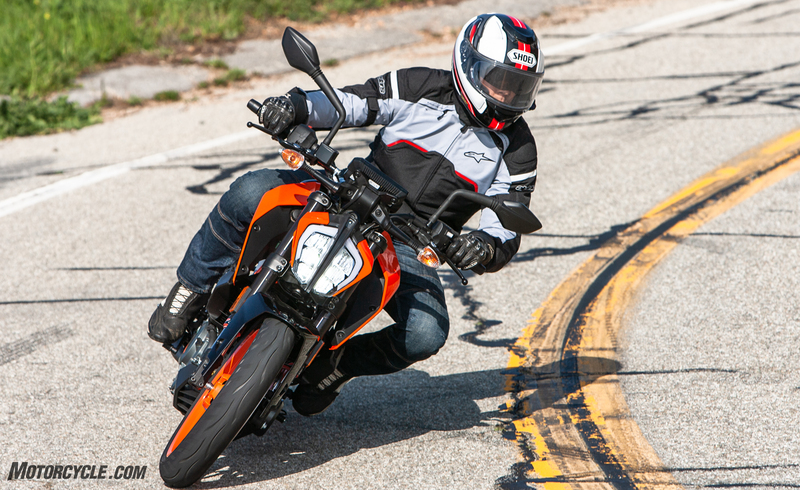 As a sporty exciting motorcycle, the KTM 390 Duke reigns supreme. 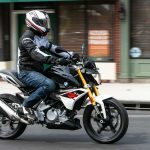 For comfort and quality while being less expensive, the BMW G 310 R is a formidable contender in the lightweight category. I think we’re going to have call this one at round five. 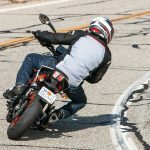 Winner by unanimous decision and undisputed champion of the Lightweight motorcycle category of MOBO, KTM “Don’t call me entry-level” 390 Duuuuuuuke! 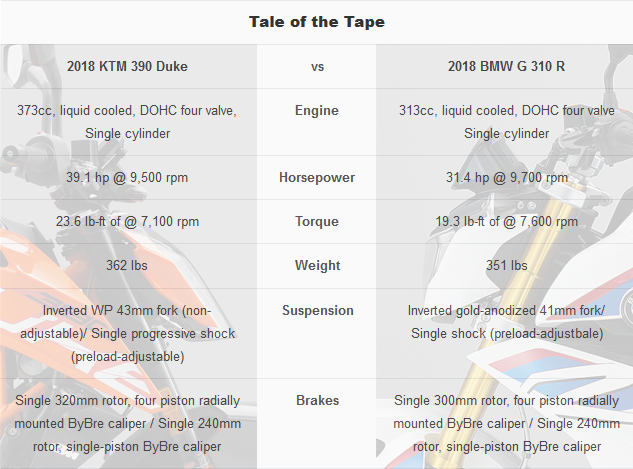 The real take away when comparing these two machines is that they are vastly different, polar opposites even. 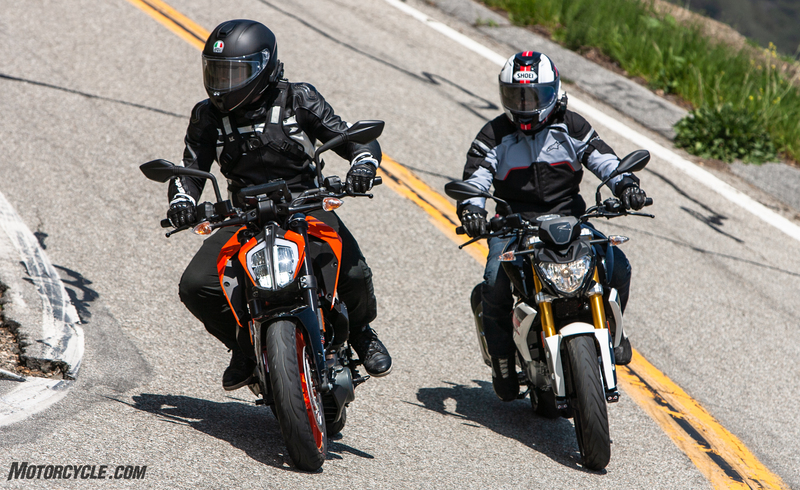 Sure, they occupy what many would call the lightweight naked class of motorcycle, but after having ridden them back-to-back, it’s clear that they are for two different buyers. 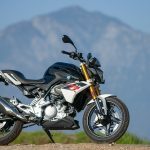 Styling is vastly different, ride position is a stark contrast, and the general attitude of the motor is fairly different. 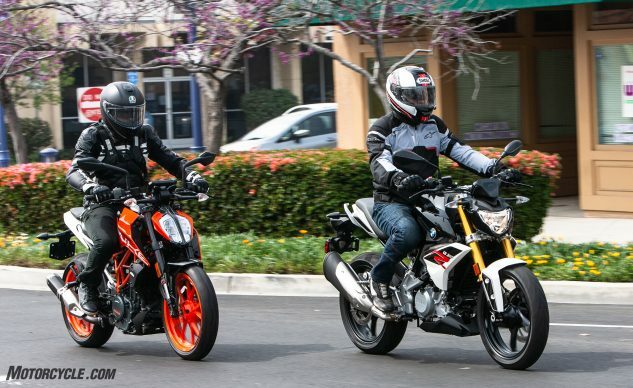 The KTM pulls ahead with niceties like ride-by-wire throttle, the TFT display, and backlit controls, yet the BMW is hardly a loser when compared to the Duke. It’s simply, different. 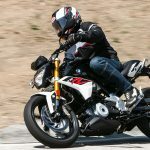 The BMW had the cleanest look, devoid of any unsightly wiring harness sections or stray cables, which can’t be said for the 390 Duke. 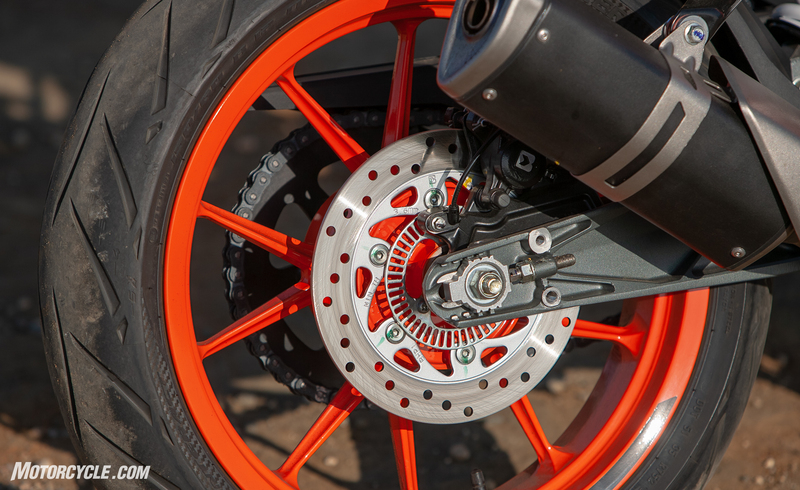 The wiring harness is tucked away but still visible and looking almost as though it is being showcased by the chro-moly orange trellis frame. It really boils down to the experience you want and the looks that get your blood pumping. 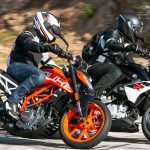 Our scores rate the 2018 KTM 390 Duke as the winner in the comparison, however, the real take-aways is whichever brawler you choose between these two, you’ll have a great motorcycle. Ryan Adams and Troy Siahaan signing off from the Thunderdome. Good fight, good night! Rake/Trail 25.1º/4.0 in. 25°/3.7 in. Seat Height 30.9 in. (claimed, 30.3 in. and 31.5 in seats optional accessories) 32.7 in.